Ok, so I actually finished the purple socks a couple weeks ago, but still! I’m so happy with them. I bought the Knit Picks sock blockers and Soak wash so I could properly block the socks. I’m still surprised at how well they came out. Even after tugging and pulling the socks off of the blockers, they still kept their shape beautifully. The grey sock has been giving me some troubles lately, mostly around the heel. I thought I’d finished the heel on Monday, only to find out on Tuesday that half the stitches fell off the needle in transit. If normal stitches fall off, I can usually fix them to an extent. These, though, were stitches and yarn overs and were on different rows from each other. It was a mess. 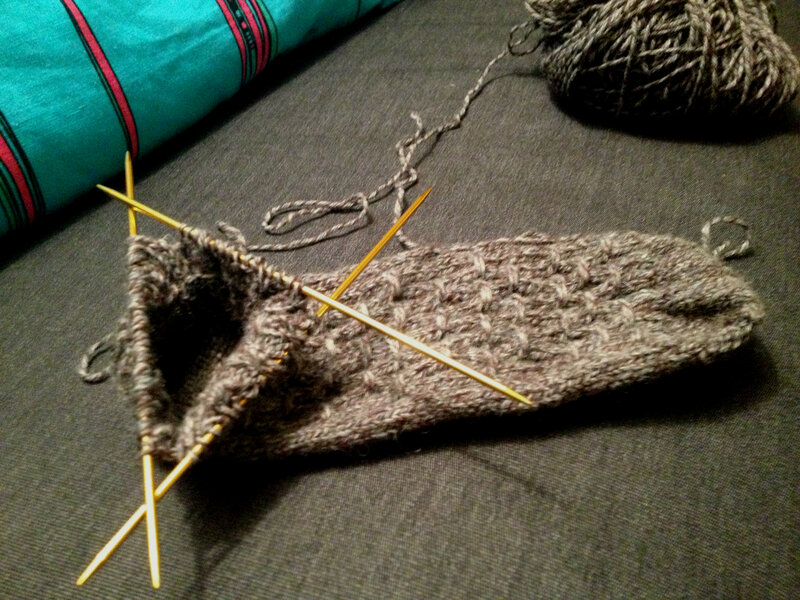 I ended up ripping back and redoing the heel, which went even worse the second time through. But I will ever soldier on! Despite a crazy, wonky heel, I am going to continue. Let me clarify, it doesn’t look crazy. I just know the knitting process went crazy. I’m back to knitting around the leg, so I’m in the home stretch. 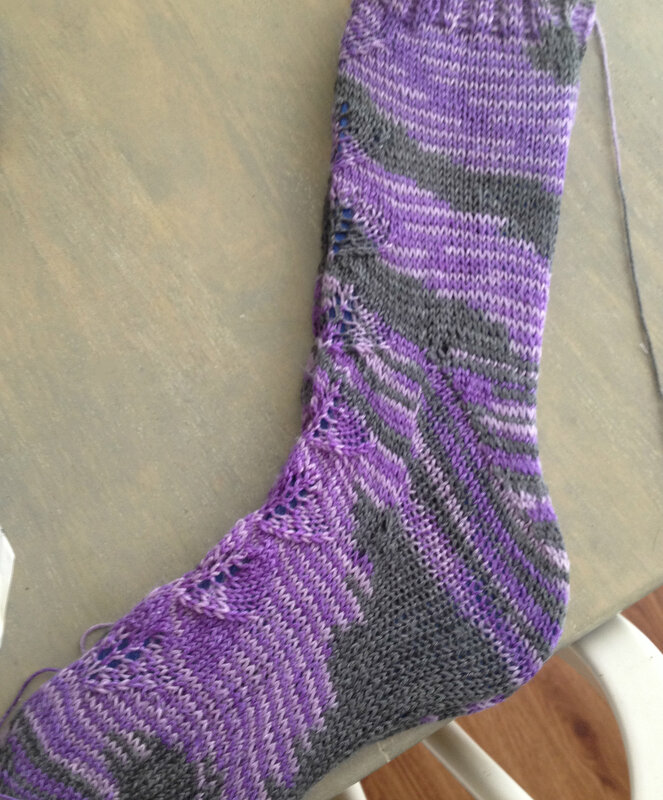 I can just hope that sock two will have a better heel result. Then I’ll be happy about it. Oh, and adventurous cooking news! I tackled a fear last night. Growing up, you couldn’t get me near beets. I think it has to do with a traumatic experience where my mom made me eat pickled beets. That thought still grosses me out. I decided it was time to conquer that fear, so I chopped up beets and a clove of elephant garlic (I’d put garlic in everything if I could get away with it) and roasted it in the oven for 35 minutes at 400 degrees Fahrenheit. Skeptical though I was, the beets were sweet and lovely. I took pictures of my plate to prove to my family that I’d made them. Dad said he wouldn’t believe me unless he saw it. So, I videotaped (that’s an old-fashioned word, now!) me eating the beets. So far with adventurous cooking, I’ve tried spaghetti squash, chayote squash, beets, turnips, butternut squash, nectarines, plumcots, and tofu. I have some more tofu to experiment with in the fridge, along with eggplant. I’m not entirely sure what I’m going to make tonight, but it will include the eggplant somehow.